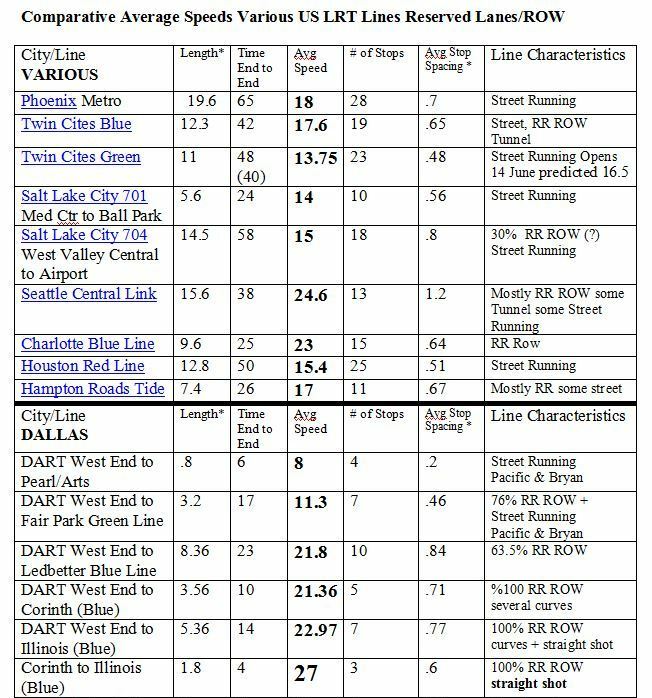 Reality Check: How plausible are Project Connect’s time/speed claims for Highland-Riverside urban rail plan? In a Blitzkrieg of promotional presentations over the past several months, Project Connect leaders and team members have been touting ambitious travel time and average speed projections for their urban rail project proposed to connect the Highland ACC site with the East Riverside development area. 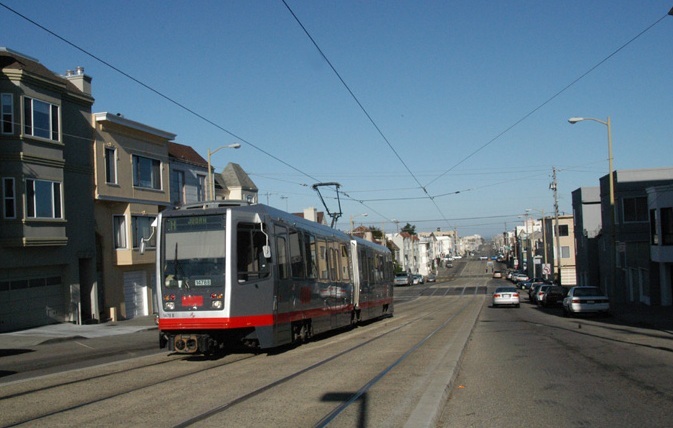 In various presentations, the agency’s Urban Rail Lead, Kyle Keahey, has claimed that the line would provide an average speed of “21 to 22 miles per hour” (impressive, compared to an average of about 25 mph for motor vehicles in urban traffic, and typical local bus transit averages of about 12 mph generally and 4-8 mph running through a in a CBD). However, several anomalies immediately leap out to experienced public transit analysts. First, the distance and time projections provided by the agency — totaling 9.5 miles in 28 minutes — imply an average speed of 20.4 mph, not the “21-22” claimed by Kyle Keahey and other representatives. Second, even an average speed of 20.4 for this type of light rail transit (LRT) service in this kind of application raises professional eyebrows (and considerable skepticism) — mainly because it’s significantly higher than what is commonly characteristic of peer systems. Light rail transit planners commonly know that lines routes in street and arterial alignments, even reservations, face substantially more constraints to speed than do systems routed in exclusive, private right-of-way (ROW) alignments such as railway corridors, tunnels, viaducts, etc. (This is illustrated in the photo composite at the top of this post.) 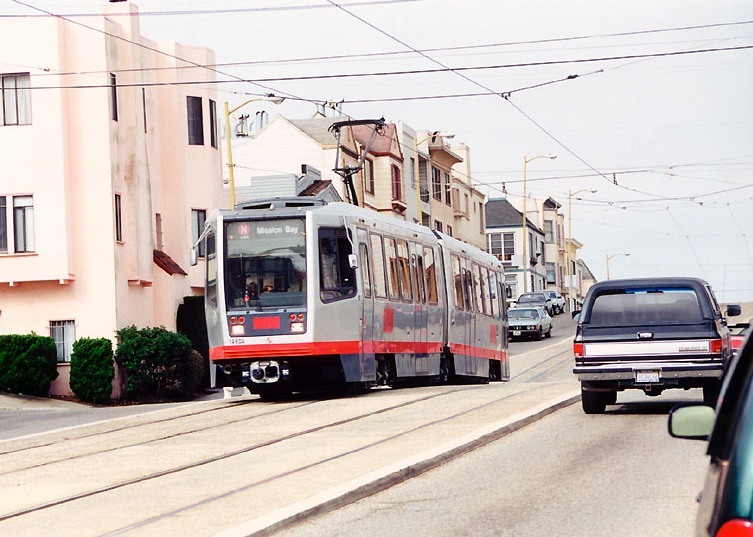 Some major constraints include: maximum speed limited to traffic maximum speed; operation constrained by traffic signals and cross-traffic; sharper curves and turning movements as route follows street grid. 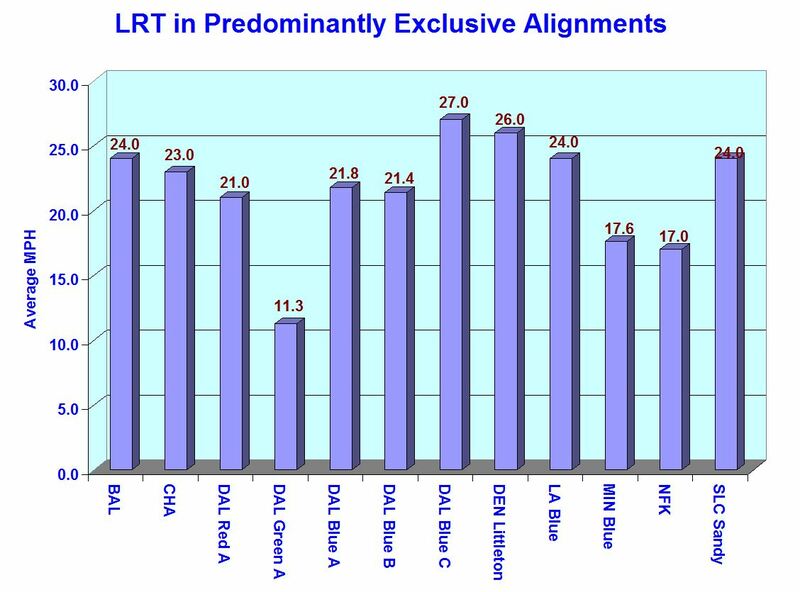 Compared with routes in exclusive alignments, the differentials usually aren’t tremendous, but enough to make a difference in schedule speeds, travel times, and other performance factors. 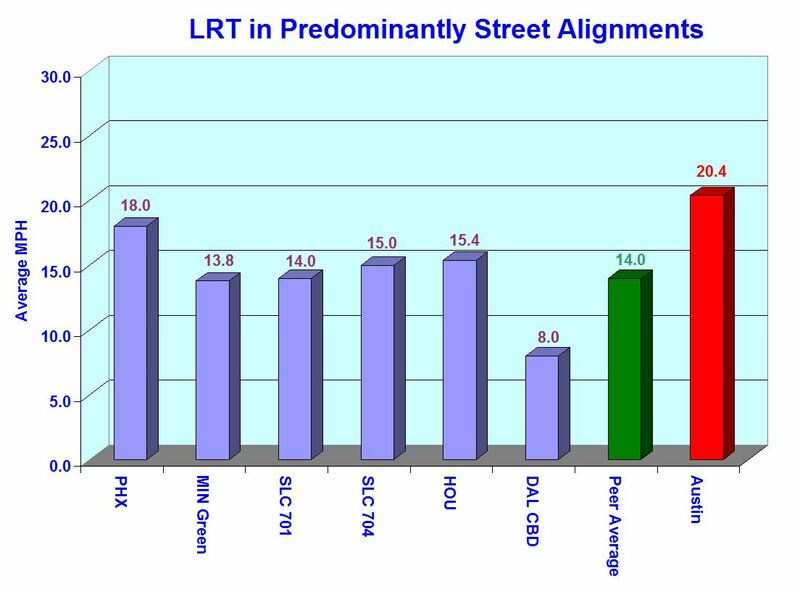 Table of LRT average schedule speeds from Light Rail Now website. 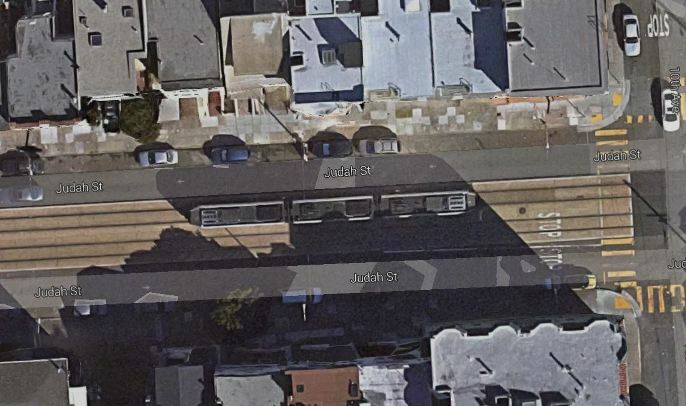 Indeed, Project Connect’s proposed line is far more of a winding, meandering route, with more traffic speed constraints and sharper turning movements, than any of the comparative peer street-running systems. It includes running in mixed traffic (Red River St.) as well as a segment through the UT campus (San Jacinto Blvd.) with heavy student pedestrian traffic crossing the alignment. 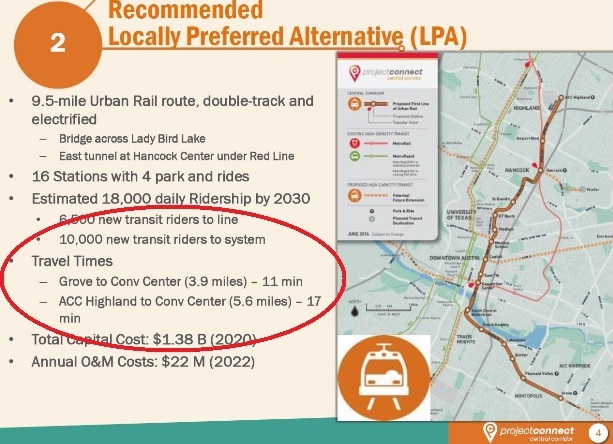 From this comparison, it can be seen that the average speed for Project Connect’s Highland-Riverside line, based on the projected travel time presented by the agency, is significantly above all of the peer systems running predominantly in street right-of-way. Not only does Project Connect’s line show a higher average schedule speed than any of its peer systems, but it’s a full 6.4 mph — nearly 46% — above the peer average. This seems highly implausible, particularly in view of the more convoluted, tortuous profile of the proposed alignment and the other encumbrances we’ve cited. Indeed, the travel time (and implicitly schedule speed) assumptions of Project Connect planners seem more appropriate for the operating characteristics of a route in predominantly exclusive right-of-way rather than running on streets and arterials, as they’ve designed it. 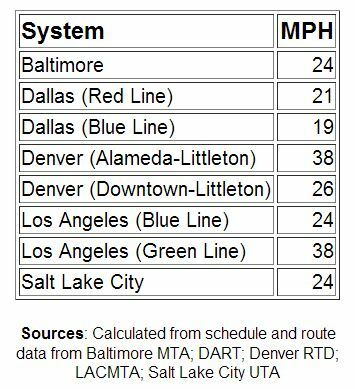 Projecting reasonably accurate travel times and speeds is important to planning any rail transit project, and not just because of plausibility with respect to public scrutiny. 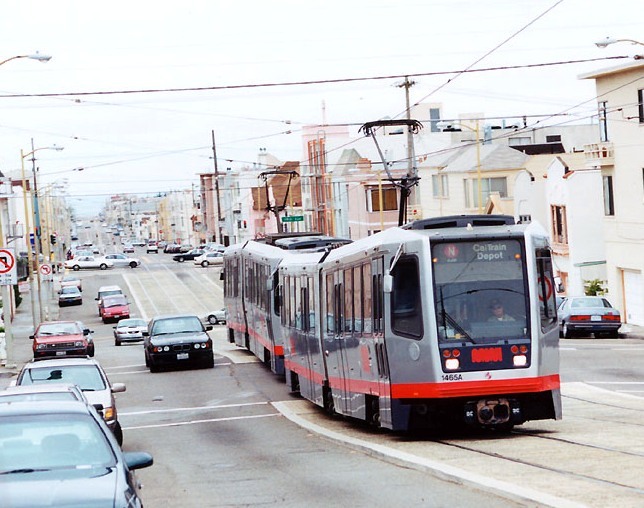 Travel time constitutes one of the key inputs into the ridership modeling process. Underestimating travel time, by reducing what’s called the “impedance” to the process of calculating trip generation and modal split, can readily lead to overestimation of ridership. In addition, slow travel speeds also raise the possible need for additional rolling stock to fulfill train frequency and passenger capacity requirements. 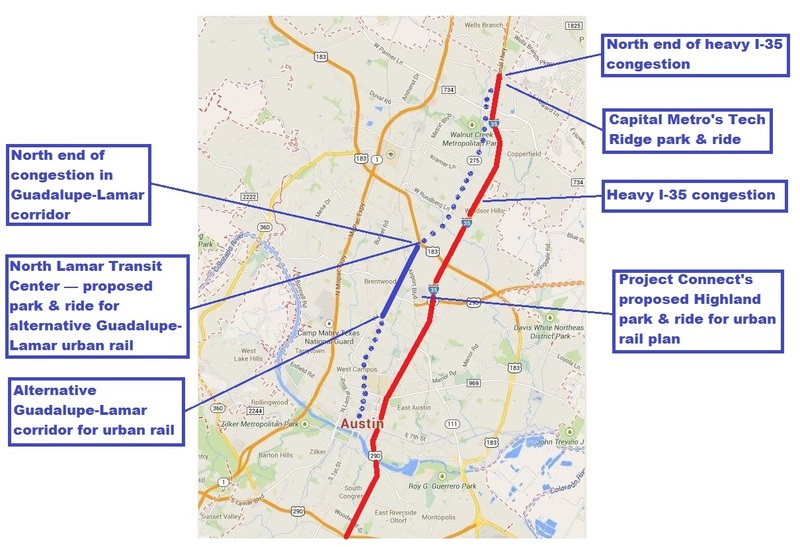 The following comments were made during Citizen Communications to the City of Austin’s Urban Transportation Commission on 10 June 2014 regarding Project Connect’s proposed 9.5-mile, $1.4 billion urban rail starter line connecting East Riverside (southeast) with the Highland ACC site now under development (north). In the end, the commission voted, with minor amendments, to recommend Project Connect’s proposal to the City Council. 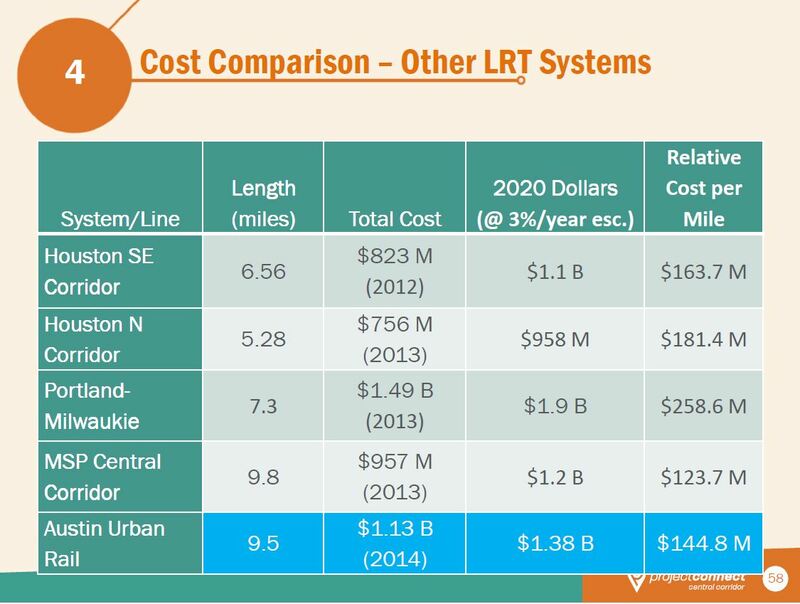 (1) It spends $1.4 billion to put urban rail in the wrong place. 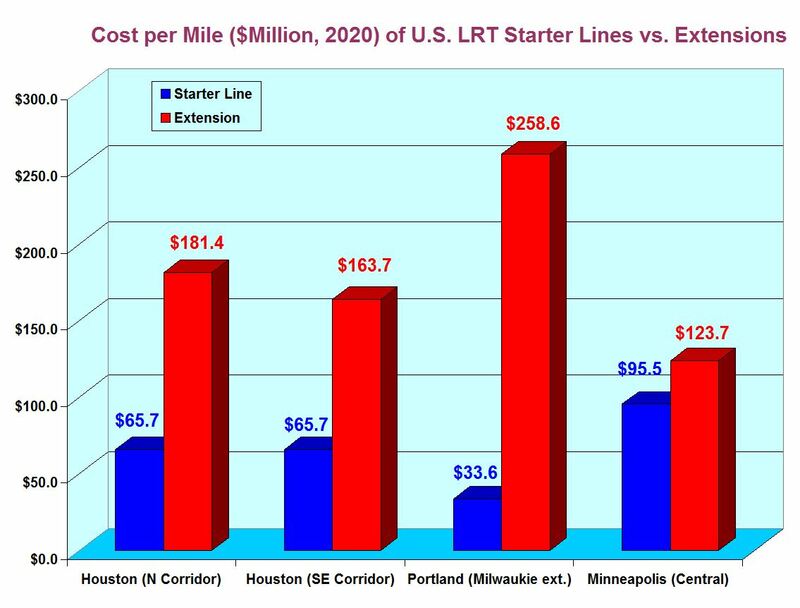 (2) It will hinder and constrain future rail development. 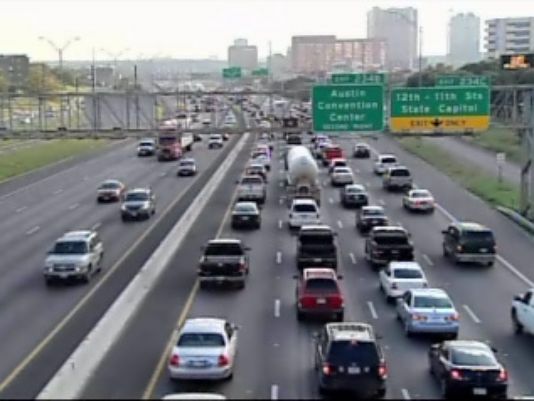 (3) A vote for this flawed plan is also a vote to permanentize lower-capacity MetroRapid bus service in our strongest, densest travel corridor, Guadalupe-Lamar. 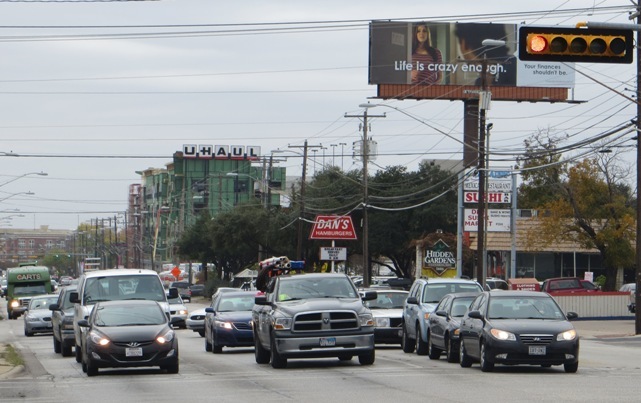 Guadalupe-Lamar is the outstanding corridor to start urban rail — among the top heavy travel corridors in Texas, a long-established commercial district, with major activity centers, the city’s core neighborhoods, and the West Campus, having the 3rd-highest residential density in Texas. 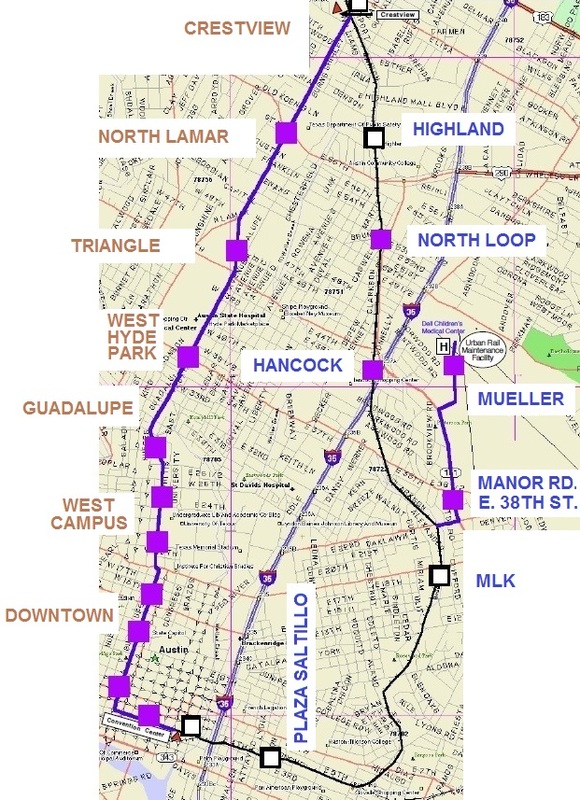 In contrast, Project Connect proposes to forsake the central city’s heaviest and densest local corridor and instead connect a weak corridor, East Riverside, with a non-existent travel corridor through the East Campus, Hancock, and Highland. By wasting over a billion dollars on urban rail in this meandering, misguided route, Project Connect will divert scarce funds from future rail development. Project Connect’s Riverside-East Campus-Hancock-Highland plan comes “gold-plated” with a new $130 million “signature bridge” over the river and a $230 million tunnel at Hancock. But it runs in mixed street traffic from UT to Hancock. 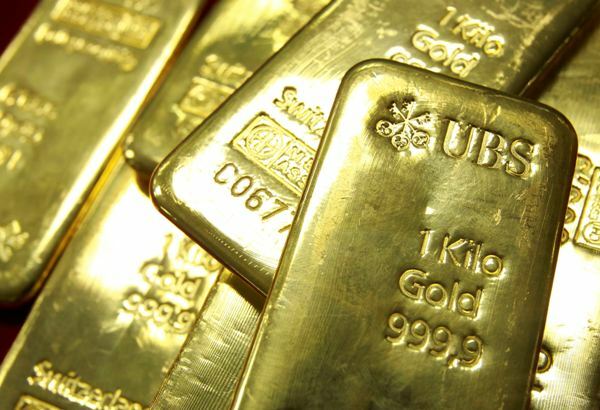 This is a proposal that costs too way much for too little value. 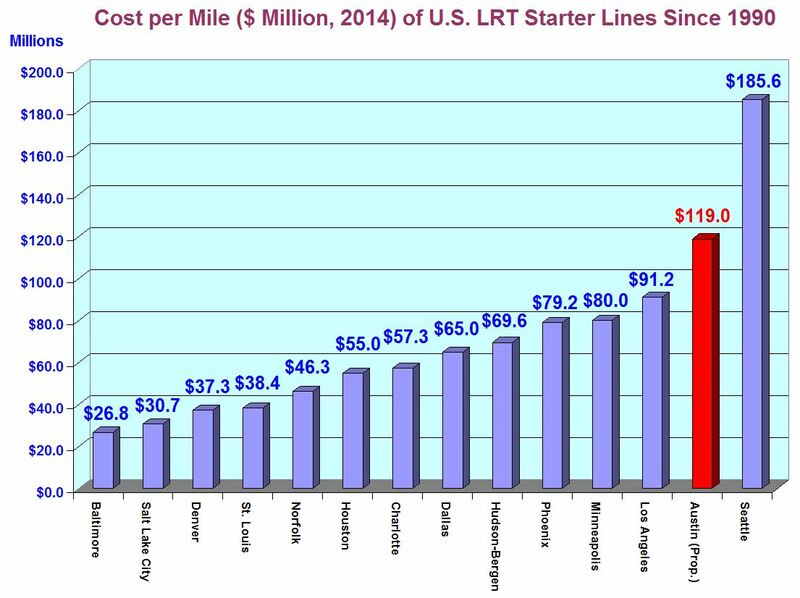 And it’s the third most pricey urban rail starter line, by cost per mile, in U.S. history. City officials now routinely propose a major property tax increase to finance the local share of Project Connect’s plan. 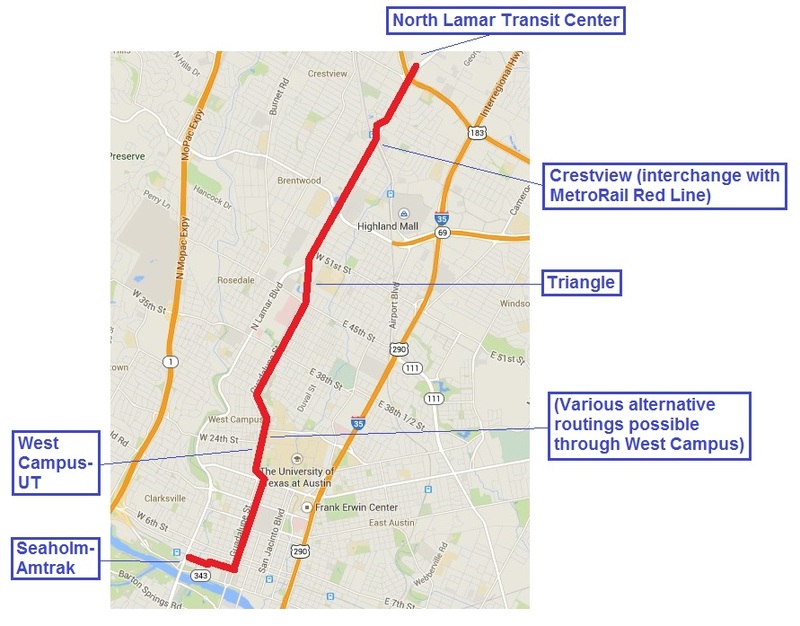 Voting for Project Connect’s urban rail plan for East Riverside to Highland also means voting to pour concrete for bus lanes and other bus facilities on Guadalupe and Lamar that will prevent an urban rail alternative in our heaviest, neediest corridor for decades. 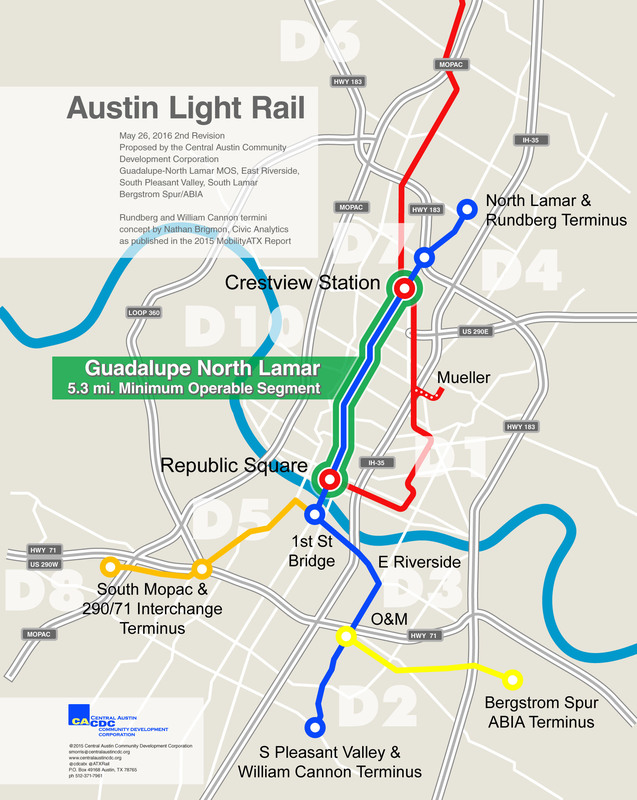 The current MetroRapid bus service on Guadalupe, Lamar and South Congress carries 6,000 daily riders, less than one-eighth of the 51,000 forecast for light rail in that same corridor. In contrast to major rail planning in the past, the public has basically been cut out of this process. Now Mayor Leffingwell and his administration announce they’re tossing in a dollop of road projects that even some councilmembers criticize as failing to fit into the Imagine Austin concept of a walkable, dense city. In effect, they’re packaging a dubious, wasteful rail project with questionable road projects, and wrapping a “congestion relief” ribbon around it. 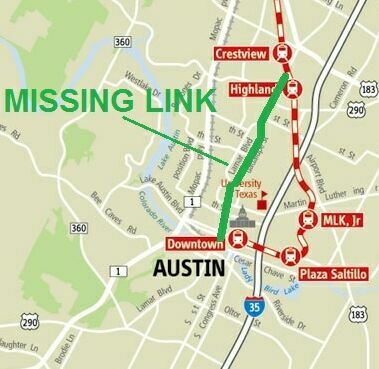 Roger Baker: Austin’s ‘Strategic Mobility Plan’ — smart planning or a billion dollar boondoggle? You are currently browsing the archives for the Design and cost issues category.